Strength – Its renowned for its extreme tensile strength and higher elastic modulus, thus making it one of the strongest and stiffest materials discovered to date. The covalent sp2 bonds formed between the pure carbon atoms makes these tiny nanostructures incredibly strong. Electrical – The carbon nanotube is either metallic or semiconductors along the axis of the tubes. Theoretically, these nanotubes are more than 1,000 times better at conducting electricity, as compared to conventional copper. Optical – Single-walled carbon nanotube are efficient at light absorption, and fluorescence, and have excellent Raman spectroscopy properties. These make it a suitable material to be used in various optical-based industries. Thermal – The functionalized single-walled carbon nanotube is an active conductor of heat, along with the tube. These are known for the unique ‘ballistic conduction’ phenomena. However, these are also good insulators, along with the axis of the tube. These can withstand a temperature of up to 750˚ C, in a normal atmosphere, while its heat conductivity rises to an immense 2,800˚ C, in vacuum conditions. Its very small in size, and the diameter measured in nanometers. They may be a few microns or a few millimeters as well. The unique honeycomb-like structure of pure carbon atoms in this carbon nanotube is an ideal way to explore the single dimensional physics and the stronger Coulomb correlations.Apart from this, the cylindrical shape of these carbon-based nanostructures gives them a unique quantum phenomenon when put near parallel magnetic fields, thanks to the Aharonov-Bohm effect. 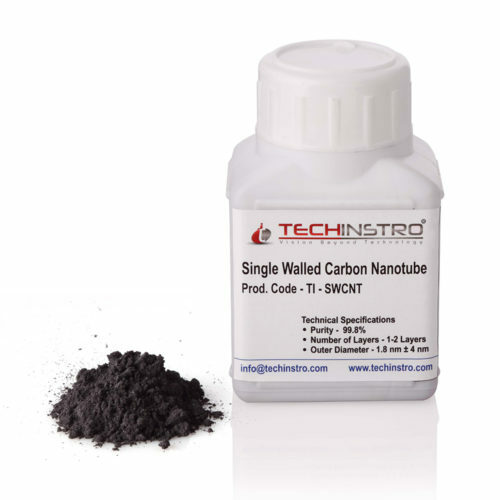 These excellent properties make functionalized single walled carbon nanotube an ideal choice for numerous industrial and R&D applications and potential for more widespread use in the near future. A single-walled carbon nanotube is an innovative and efficient discovery. These are a tiny, hollow and considerably long cylinder that forms when pure carbon atoms form a hexagonal lattice with each other. The wall of the nanotube made of a single atomic sheet spread out like the honeycomb structure. The carbon nanotube with single-walled structure has several unique and efficient properties which find widespread application and potential in commercial as well as R&D industries all over the world.